Evolution Live Caribbean Stud poker has been developed in association with Games Marketing who hold the rights for this particular version of the game. My Video review gives a quick overview, where I explain the playing rules and other aspects of the game. There are other versions of Live Caribbean Stud poker but this is the only one to come with a 5+1 Bonus Side Bet and a Progressive jackpot. Unlike other live casino poker games, Caribbean Stud poker is played with just two 5 card hands being dealt. The dealer gets one hand the player position gets the other. There are no community cards involved. It’s a straight shootout, the best 5 card poker hand wins. An unlimited number of players can play the “players” hand, which simplifies the dealing process and keeps the game quick. Although the game is straight forward there are a few things that make it exciting to play. The first card reveal of the Dealers hand. The Progressive Jackpot side bet. Caribbean Stud Poker starts with the player placing a mandatory Ante Bet. Two Optional Side bets, the 5+1 Bonus and Progressive Jackpot can also be placed at this time. 5 cards are then dealt face up to the Player position. The dealers hand is dealt face down, with exception of the first card which is left face up. The player decides whether to play or fold the hand. If he wants to play the hand he places a Play bet which must be equal in value to the Ante Bet. The initial Ante bet is lost if the player folds his hand. 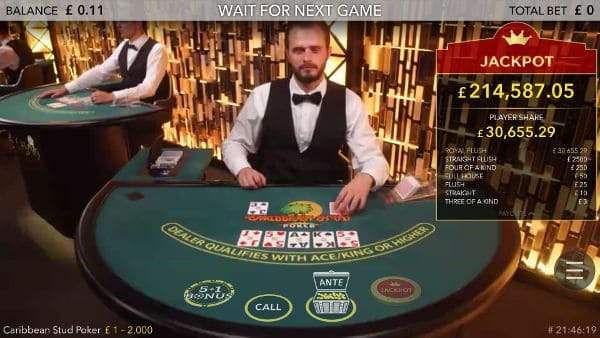 If the player has folded, the Side Bets (5+1 Bonus and Progress Jackpot) are still “Live” and will pay out if won, regardless of what the dealer has. The dealer then reveals his remaining 4 cards. The dealer needs a minimum of Ace King in his hand to qualify. 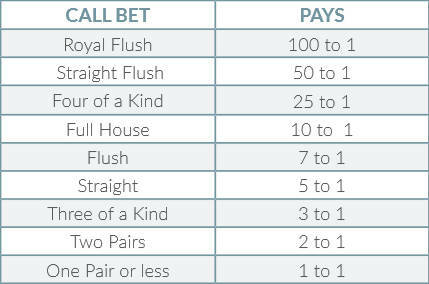 When qualifying the dealer is be able to make a payout for the Call Bet if the players hand has won. If the dealer hasn’t qualified the bet is returned to the player if he’s beaten or Tied with the dealer. 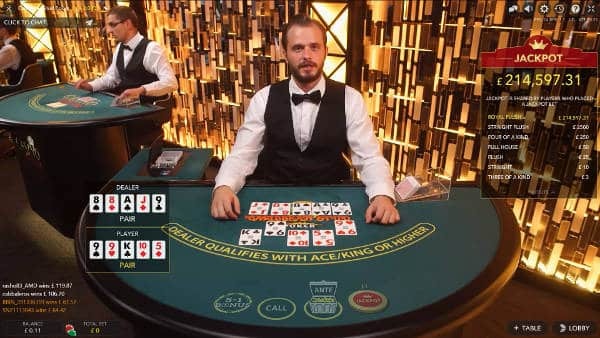 If the dealer qualifies and the player Wins – The player will win even money on the Ante Bet and the call bet will win according to the Poker Hand rankings payout table. If the Dealer does not qualify and the player wins – The player wins even money on his Ante Bet and the Call bet is pushed. When the dealer and player tie – Both the Ante and Call Bets will Push. 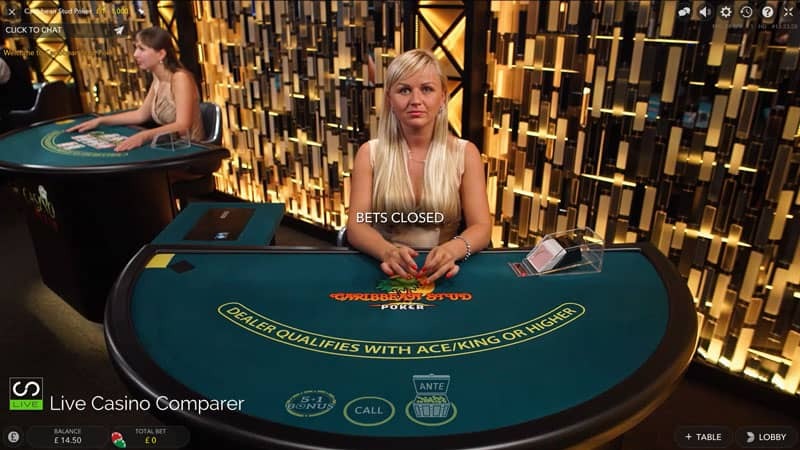 If the dealer qualifies and beats the player – Both the Ante and Call bets are lost. Theoretical payout on total wager: 98.18%. 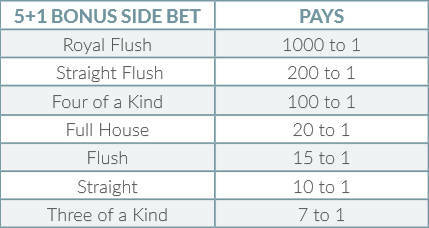 This is an optional side bet that players can make when they place the initial Ante bet. The 5+1 bet uses the players five cards and the dealers up card to make a 5 card poker hand. If the hand is Three of a Kind or better it wins. The bet is valid through the whole game round, so even if the player folds his hand or is beaten by the dealer the side bet still pays. The progressive jackpot is another optional side bet. This one is only available at participating casinos and costs £€$1 to enter. The share of the Jackpot is paid out to all players playing the bet, while smaller prizes are paid directly to each player. As of today, April 25, 2019 the running total for the Evolution Live Caribbean Stud Poker Jackpot is – £534,628. The playing interface has been optimised for Desktop and Mobile Devices. The desktop version come in two display options. Full Screen and a mixed mode (which is normally reserved for people playing with slow internet connections). However either modes can be selected through the preferences. The Table and Phone interface is available in landscape mode only. Most Evolution Casinos carry Caribbean Stud Poker, but not all have opted for the Progressive Jackpot. The * denotes Caribbean Stud Poker with the Progressive Jackpot. Royal Panda Roulette To see the latest Live Casino promotions. Click Here. Leo Vegas Roulette To see the latest Live Casino promotions. Click Here. Mr Green Roulette To see the latest Live Casino promotions. Click Here. Dream Catcher 0.10 – 1k None To see the latest Live Casino promotions. Click Here. Dream Catcher 0.10 – 2.5k BetVictor Blackjack To see the latest Live Casino promotions. Click Here. Dream Catcher 0.10 – 10k ComeOn Blackjack To see the latest Live Casino promotions. Click Here. Roulette Live Birmingham To see the latest Live Casino promotions. Click Here. Grosvenor Victoria To see the latest Live Casino promotions. Click Here. Unibet Francais Roulette To see the latest Live Casino promotions. Click Here. Pokerstars Texas Hold’em To see the latest Live Casino promotions. Click Here. Casumo Roulette To see the latest Live Casino promotions. Click Here. Vegas Speed Roulette To see the latest Live Casino promotions. Click Here. Hippodrome Roulette To see the latest Live Casino promotions. Click Here. Dream Catcher 0.10 – 1k None No Live Casino Bonus. Dream Catcher 0.10 – 1k Dublin Blackjack To see the latest Live Casino promotions. Click Here. Dream Catcher 0.10 – 5k Blackjack Promo To see the latest Live Casino promotions. Click Here. Dream Catcher 0.10 – 2.5k None No Live Casino Bonus. Dream Catcher 0.10 – 2.5k None To see the latest Live Casino promotions. Click Here. MarathonBet Roulette No Live Casino Bonus. Dream Catcher 1 – 10k None No Live Casino Bonus. Dream Catcher 0.10 – 5k None To see the latest Live Casino promotions. Click Here.